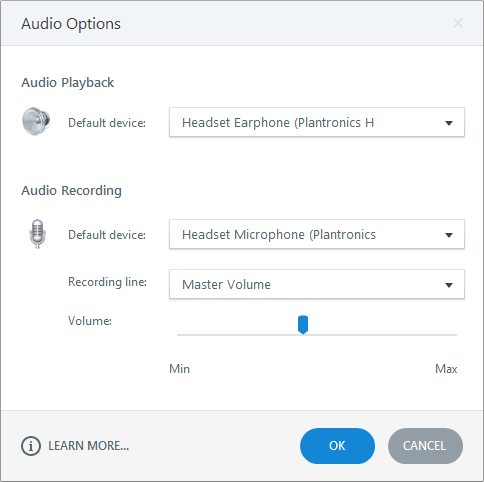 Articulate Storyline has some quick-access tools for previewing audio, adjusting volume, launching the built-in audio editor, switching to a different audio file, and exporting audio clips. Click the audio icon at the lower left corner of the slide or click the audio track in the timeline to reveal the Audio Tools—Options tab on the ribbon. Low: Lowers the volume to 50% of the original. Medium: Sets the volume at 100%, meaning there's no change to the original volume. This is the default option. High: Raises the volume to 150% of the original. Mute: Silences the selected audio track. Click Audio Editor to modify the selected audio clip. Learn more about using the built-in audio editor.